Camping in Shenandoah National Park offers an experience worth adding to your bucket list. After all, this stretch of land runs through the beautiful Blue Ridge Mountains in Virginia and offers a massive network off trails–over 500 miles of trails!–including the famous Appalachian Trail. But first, you’ll need to figure out a place to park your RV or set up tent. Shenandoah National Park camping is available at several campgrounds directly inside the park. In addition, there are several campgrounds near Shenandoah National Park that offer attractive amenities and are within close driving distance to the park. Most of the park is forested with wetlands, waterfalls, and rocky peaks to explore. Get ready to see all kinds of wildlife out here in bear country! There are deer, black bear, raccoon, and a tweet-worthy variety of bird species–among other furry creatures. What is the Weather Like Year-Round at Shenandoah National Park? Summer is the most popular time of year to visit the park because the weather is beautiful! January is the coolest month of the year with the average low at 21 °F and the average high at 35°F. The weather heats up from there; by April the average low is 38°F and the average high is 56°F. June, July and August are the warmest months with an average low around 57°F and an average high around 74°F. There are five campgrounds in Shenandoah National Park: Big Meadows, Lewis Mountain, Mathews Arm, Loft Mountain, and Dundo Group Campground. These camp sites are operated by Shenandoah National Park and offer affordable camping with bathrooms and other basic amenities. There are no RV-only campgrounds in the park, but there are pull-through and back-in sites for RVs available at Mathews Arm, Big Meadows, and Loft Mountain Campgrounds. Shenandoah National Park camping is available on a first-come, first-served basis. Although, reservations are highly recommended especially during peak season and on weekends and holidays. If you do not make a reservation, it is possible everything will be full or you’ll have to switch campsites in the middle of your stay due to the arrival of people with reservations. Learn about ongoing activities during your stay by visiting the Byrd Visitor Center or the Dickey Ridge Visitor Center. Below you’ll find a detailed overview of each campground in Shenandoah National Park. Big Meadows Campground is usually the first campground in the area to open for the season. It is centrally located near popular hiking trails and facilities throughout the park. There are three waterfalls you can walk to from camp, plus the Meadow region is ripe with plants and wildlife. Hungry after your hike? Check out the serene picnic area located near the entrance to the Appalachian Trail. A variety of recreational activities are offered in the park throughout the year. Amenities at Big Meadows Campground include laundry facilities, showers, and a camp store with access to wood, ice, and phones. Firewood used for campfires must be purchased in the park. Quarters are required to operate showers and laundry machines. Dump stations are available ¼-mile outside of camp. Pets are welcome but they must be well-behaved, leashed, and supervised at all times. Generator use is limited to certain portions of camp. Large group sites are available for reservation up to one-year prior to your visit. Lewis Mountain Campground is the smallest campground in Shenandoah National Park. Electric and water hookups are not offered at this camp, although pads are provided for setting up tent. Campsites can accommodate up to six people, and RV sites can accommodate one RV, motorhome, pop-up, etc., along with one vehicle. There are several cabins for rent throughout the park. Coin-operated showers and laundry facilities are available for use and maintained by the Shenandoah National Park concessioner. There are picnic grounds located near the entrance to camp, as well as picnic shelters near cabins. Water and utility sinks are available as well. You can purchase firewood on-site or collect dead wood found in the park to make a fire. Designated fire grates are provided and must be used to contain all campfires. Campers can access the dump station at Big Meadows Campground (the closest campground in the park). Generators are limited to certain areas of camp and time restrictions are enforced. As you make your way to Mathews Arm you’ll turn off Skyline Drive at mile marker 22.1, weaving past the visitor center and overflow parking. Take your pick between tent and RV camping, with each site accommodating up to six people. Coming with a large group? There are three group sites that can accommodate groups of 7 to 25 people. Group sites come with picnic tables, fire grates, and parking. You can reserve group sites up to one year in advance. Traces Trail, a 1.7-mile loop, circles the campground. Along with miles of trails, Mathews Arm offers a variety of events during camping season, there’s even an amphitheater on-site. An RV dump station is open, and so too are trash and recycling stations. Water and utility sinks are offered; water spigots and drinking fountains can be found throughout the park. There are no shower facilities or laundry stations at this campground. The closest campground with these amenities is Big Meadows Campground. Fire grates are provided for campfires, and firewood can be purchased in the park. If you are bringing firewood in it must be USDA certified and labeled. Well-behaved, leashed, and monitored pets are allowed. Check with the visitor center to find out which trails prohibit dogs. Certain sites are designated as “generator-free.” Other parts of camp allow generator usage between 8 and 10 am, and 4 and 7 pm—hours of usage extend to 9 pm from October 15 through closing. Welcome to the largest campground in Shenandoah National Park! Perched atop Big Flat Mountain, this campground has incredible views to the east and west. Nearby trails offer a chance to see two scenic waterfalls, and the Big Run Wilderness area is close by. Trails that lead straight from camp include the Frazier Discovery Trail and Doyles River Trail. Shenandoah National Park camping at Loft Mountain offers the following amenities: restrooms, showers, running water, and laundry facilities. Quarters are required to operate laundry machines and showers. A dump station for RVs and trailers is available near campsites. In addition, there are trash and recycling bins. Generators are allowed in certain areas of camp and during certain time frames—in the mornings and evenings. Dogs are allowed but must be well-behaved, on a leash, and observed at all times. This tent-only Shenandoah National Park camping site is open to groups of 7 to 20 people. Campers check-in at Loft Mountain Campground. Camping is only allowed in shaded site areas, and there are three distinct sites in the park. Two sites overlap one another and the other site is separated by restrooms and a recycling/dumpster station. Each group site comes with picnic tables and fire grates. Campers enjoy access to water, restrooms, and plenty of hiking trails. This small group campsite is located near Loft Mountain Campground, where you’ll find additional amenities like showers, laundry facilities, a phone, as well as a camp store that sells wood, ice, and groceries. 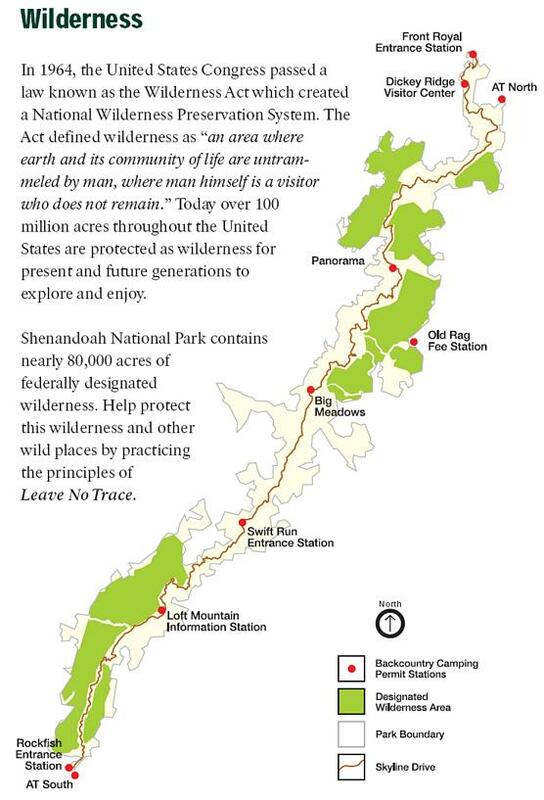 Thousands of people spend the night in Shenandoah National Park’s massive backcountry and wilderness area. While it is permitted, there are regulations in place to protect the land, wildlife, etc. First and foremost, backcountry campers must operate under the ‘leave no trace’ methodology. Secondly, a permit is required and can be obtained at one of the visitor contact stations. You can also get a permit via email if your trip is at least two-weeks in the future. Don’t forget to bring your permit with you so you can leave a copy in one of the self-registration boxes at each entrance. Keep another copy of your permit secured to your pack or tent. You don’t have to stay in the park to enjoy all that it offers. There are many campgrounds near Shenandoah National Park open year-round with awesome amenities and accommodations. The park stretches 105-miles between its northern entrance at Front Royal and its southern entrance near Waynesboro. We’ve detailed the closest and highest rated campgrounds in the area below by distance—closest to farthest away. This 73-acre campground has all the comforts from home, along with many activities to partake in. In addition, it is conveniently located down the road from Luray Caverns. From premium RV sites with full hookups to tent sites tucked beneath the trees, there are plenty of options here. Deluxe tent sites come with a tent area, a 10’ x 10’ deck shelter, picnic table, water hook-up, fire ring, and 30-AMP electric. Premium pull-through and back-in RV Sites start at $55 per night and offer a concrete pad and patio, picnic table, sewer and water hookups, 30/50-AMP electric service, cable TV, a fire ring, and charcoal grill. Looking for a cozier way to stay? You can rent a premium loft cottage starting at around $150 per night. The great thing about this campground is that it’s super close to Shenandoah National Park and offers a lot more activities than any of the campgrounds within the park. After all, Yogi Bear is home to an awesome Water Zone & Splash Pad that features new waterslides. Dry off playing a round of golf at the 18-hole mini golf course. There’s also a gem mining experience, pedal boats, fishing pond, jumping pillows, laser tag, an outdoor movie theater, playgrounds, and much more. This rural piece of paradise is one of the closest campgrounds to Shenandoah National Park. Enjoy RV and tent camping, as well as cabins for rent. There are primitive campsites with no hookups and grass pads, as well as tent sites with electric hookups and gravel site pads. For RVs, pick between pull-through or back-in sites with full hookups and 30/20 or 50/30-AMP electric service. There are deluxe RV sites with patios, as well as level sites on gravel. All sites come with a picnic table and fire ring. There are two cabins to pick from, along with a deluxe yurt for rent. Wi-Fi is available throughout the park. In standard KOA fashion, this campground is home to a lot of amenities, including two pools, volleyball, and table tennis. Plus, there are plenty of open courtyards and shady spaces to play games or have a picnic. Not only is this campground close to the park and the Luray Caverns, but also, it’s nearby several fascinating Civil War sites such as Harpers Ferry National Historical Park and New Market Battlefield State Historical Park. Dogs are welcome at all campsites, even in cabins and yurts (additional fees apply). There’s a dog park on-site. Located on the banks of the Shenandoah River and in the heart of Shenandoah Valley, River Run Campground offers primitive camping at its best. This campground maintains 17 riverfront sites, and each site comes with 1 picnic table and a fire ring. In addition, they offer a large area for groups of 25 campers or more. While group sites are not directly on the water, they are next to a river access point. Self-contained RVs and campers are welcome; generators are permitted. Fun things to do in the area include taking a scenic drive along the 105-mile Skyline Drive, or exploring the network of caves at Luray Caverns. Plus, you are close to the Luray Zoo, home to a variety of rescued animals, a reptile jungle and petting zoo. Let the beautiful Shenandoah River and surrounding Blue Ridge and Massanutten Mountain Ranges lull you into a state of tranquility. This campground offers sites for tents and RVs, including riverfront sites. Outlanders River Camp also maintains cottage rentals. Tent sites are walk-in to provide a peaceful experience. Hand-carts are available to help you get all your gear on site without struggle. Primitive tent camping sites in the woods offer views of the river. Pick between primitive grassy tent sites and electric tent sites. Campers have access to a bathhouse with hot showers, as well as a water hydrant. There are two options for RV camping, pull-through sites with full hookups and back-in sites with full hookups. Cottages start at $165 per night during low season, and range closer to $185 during peak season and holidays. Local attractions include George Washington National Forest, Skyline Drive, and of course, Shenandoah National Park. Plus, you are less than four-miles from the town of Luray, VA, where you’ll find antique shops, horseback riding, local cuisine, and more. Walking and running trails surround the camp, as well as a golf cart trail (golf carts available for rent). There’s a fishing pond located near the RV camping section, as well as a playground for kids. Dogs are not allowed, but if you’re lucky you might spot the camp mascot Butters the cat roaming through camp. Camp Outback is home to 25 wooded campsites set beneath canopies of hardwoods and white pines. Each site accommodates up to 10 campers and comes with a grill and fire ring. Camping fees include 1-4 people, each additional person is $8. This campground near Shenandoah National Park caters to tents and is not set up for RVs. There are no electric sites and no dump stations. You can rent a river cabin or cottage starting at $150 per night during off-season. There are a variety of accommodations available, including cabins that can house up to six people. Camp Outback borders the George Washington National Forest and has a convenient walking trail that’ll take you straight to the Shenandoah River. On-site facilities include restrooms, hot showers, firewood sales, and a small camp store with canoe, kayak, raft and tube rentals. Waynesboro is a family owned and operated campground that’s been around for over 30 years. Located off the I-64 and I-81, this convenient campground offers tent and RV camping. Full hookups (water, electric 30/50-AMP, and sewer) are available. The tent area has water, electricity, picnic tables, and fire pits in general shared spaces. There are clean restrooms, hot showers, coin-operated laundry facilities, and free Wi-Fi. Activities and events are offered year-round. Plus, there’s a swimming pool, basketball court, horseshoe pits, playground, volleyball nets, softball field, and more. Pets are welcome—certain rules and restrictions apply. There aren’t many free campsites near Shenandoah National Park, and most of the free sites we located are about 50-minutes away by automobile. At any rate, here are some options for free campsites within driving distance to the park. One side of the Walmart building offers a nice grassy spot and a place to park your RV and catch some ZZZ’s for the night. Dry Run is a paved road with 1-5 campsites where you can stay for free for 14 consecutive days. This free campsite is on a gravel road and open year-round. Small RVs and tent camping only. Activities in the area include fishing, hiking, wildlife viewing, and horse trails. Campsite amenities include a fire ring, picnic tables, and restrooms. This free campsite (popular for campers with horses) is in the North River Ranger District of George Washington National Forest. This entry was posted in Nomads and tagged Best Shenandoah Campgrounds, campgrounds near Shenandoah national park, free camping shenandoah, Shenandoah campgrounds, Shenandoah National Park Camping. Bookmark the permalink.